Limited Cemetery Dance TRUE first edition (with baseball card - still in original shrinkwrap) - slipcased and in new and unread condition. Synopsis : This is the limited 1st edition printing, complete with baseball card. Still in original shrink-wrap, this is a new, unopened 1st edition in mint condition. Comes with the specially-produced slipcase. 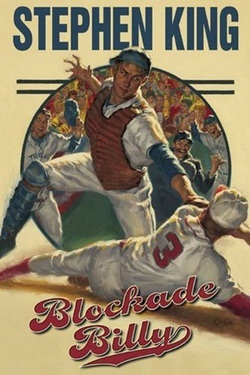 Synopsis : Even the most diehard baseball fans don't know the true story of William "Blockade Billy" Blakely. He may have been the greatest player the game has ever seen, but today no one remembers his name. He was the first ¿ and only ¿ player to have his existence completely removed from the record books. Even his team is long forgotten, barely a footnote in the game's history. Every effort was made to erase any evidence that William Blakely played professional baseball, and with good reason. Blockade Billy had a secret darker than any pill or injection that might cause a scandal in sports today. His secret was much, much worse. and only Stephen King, the most gifted storyteller of our age, can reveal the truth to the world, once and for all. This original, never-before-published novella represents Stephen King at his very best, and this Cemetery Dance World's First Hardcover Edition brings it into print for the very first time. Key Details About Cemeterey Dance's World's First Edition: * a very limited and collectible print run of just 10,000 copies -- a tiny fraction of what a New York publisher normally prints for a new release * heavily illustrated with interior artwork that not appearing in the Scribner edition * the only trade hardcover edition to be protected by a full-colour dust jacket -- the Scribner edition will be "paper on boards" which is where the cover is printed right on the book. In other words, there is no dust-jacket on the Scribner edition. * shrink-wrapped to protect your book if you're keeping it as a collector's item * Includes the Limited Edition William "Blockade Billy" Blakely baseball card, which was not issued with the Scribner edition * Beautifully designed with both the collector and general reader in mind * Published almost six weeks before any other print edition in the world A Few Words from Stephen King on Blockade Billy: "I love old-school baseball, and I also love the way people who've spent a lifetime in the game talk about the game. I tried to combine those things in a story of suspense. People have asked me for years when I was going to write a baseball story. Ask no more; this is it. ".